In an article titled “Bermuda: The New Destination for Adrenaline Junkies”, the WSJ says, “Bermuda has outgrown its reputation as a haven for stuffy, knee-socked sorts. “Luxury hotels and cuisine from chefs such as Marcus Samuelsson continue to draw a traditional crowd, but a new generation’s appreciation for the thrills to be had beyond the fairways are giving the island a new audience. “From shipwreck diving [some of the world’s best, thanks to a perilous reef that encircles the island] to jet-ski safaris and sailing [the America’s Cup arrives in 2017], not to mention a river of rum – it’s a place to take some calculated risks. “And for such a small island, there’s plenty do, whether zipping around on a moped; knocking back a few “Rum Swizzles” at the Swizzle Inn or a giant rockfish sandwich at Art Mels; staking out your own little fief in the pink sand or going on a snorkeling safari to spot parrot fish. Click here to read the full article on the Wall Street Journal’s website. Wow! who said we are boring? Note,”adrenaline junkies” in a recent Wall Street Journal article, which opens by saying, “You can still go golfing on Bermuda, but this once-staid island now offers big thrills pursuits from rock climbing to mountain biking just a short hop from the east coast.”Also “From shipwreck diving [some of the world’s best, thanks to a perilous reef that encircles the island] to jet-ski safaris and sailing [the America’s Cup arrives in 2017], not to mention a river of rum – it’s a place to take some calculated risks. Yes, nothing like a river of rum mixed with extreme sports, great combo! Mopeds and Rum Swizzle, recipe for disaster. Since we are getting much needed positive free publicity it may be an idea to relax the position on personal consumption (small amounts) of herbal tobacco that most adrenalin junkies enjoy whilst sitting on a road side casually (during their vacations). Just an idea, that way we don’t pick up a negative article in the WSJ with a young socialite from the Hamptons or Upper East Side being handcuffed and detained by Bermuda Police Service, before being frog marched to Magistrates Court, paying a fine on their Amex Black Card and then being escorted on board their returning flight, first class, from our new $2550,000,000 modern airport. …oooops I just finished my organic herbal green tea wake up cuppa, above I meant…….USD $255,000,000 modern airport. Shudda had a swizzle instead. 31 MILES OF BIKE TRAILS? wHAT HAPPENS WHEN PEOPLE TURN UP WITH THEIR MOUNTAIN BIKES AND SEE THAT THE RAILWAY TRAIL HAS THUMPING GREAT METAL GATES ACROSS IT AT EVERY JUNCTION? Not on the Ferry Reach railway trail they don’t! Cool I will go on there how long is the railway trail there? 2.5 miles in a straight line but there are lots of different trails branching off from the main pathway. You can quite easily cycle around there to your hearts content without running into any thumping great big metals gates And you get the added bonus of a little beach to cool yourself off on afterwards. I don’t think they were suggesting that you drink and drive – I think they were simply pointing out to the huge number of readers of the WSJ that Bermuda has a surprisingly large number of things that can be done on this island – its about time Bermuda was seen as something other than lying on a beach or playing golf – we actually have a ton of really cool experiences people can enjoy – they are finally getting some exposure. 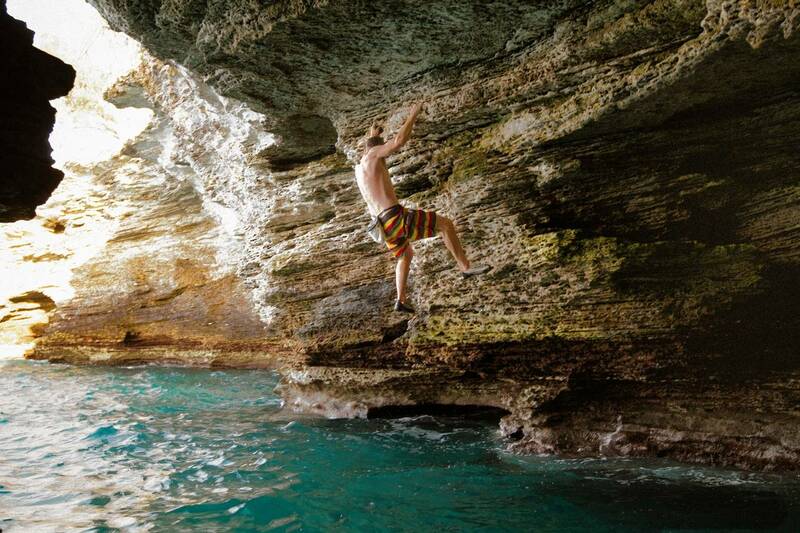 Cliff climbing, cliff jumping, cave diving, jet skiing, water skiing, wreck diving and that’s without thinking! Do you know who I contact to go cave diving? No – try calling one of the diving societies like BSAC. BTA – promote cave diving too. There are lots of divers who love to cave dive and we’ve got some beautiful spots in explore particularly in Tom Moore’s Jungle. However, I would suggest that you issue permits to keep them protected from harm as they are fragile. Freezia trees?? ?- never seen one! But for the rest – terrific, now we need info out there so people can hook up with these activities.